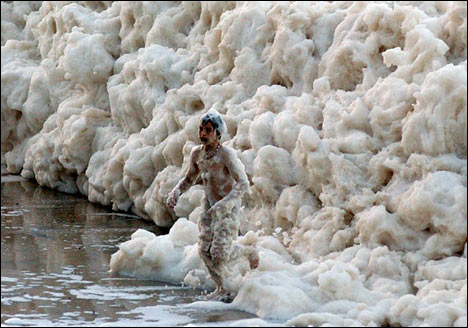 Amazing photographs of "Crazy ocean foam ... near Sydney" like the two shown on this page are so weird that many web surfers (and some real ones) think they must be fakes. They're real all right, but they were not taken anywhere near Sydney. 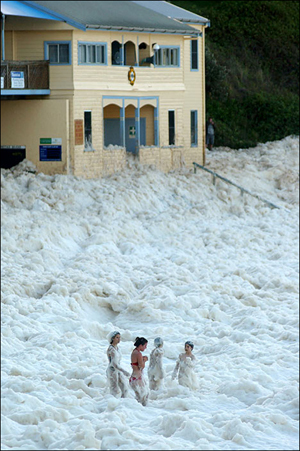 They show masses of foam four meters (13 feet) deep, washed up at Yamba, a small beach and fishing resort 677km (421 miles) north of Sydney, Australia's largest city, but only 287km (178 miles) south of Brisbane, its third city. Last week, a similar phenomenon occurred further north, at Point Cartwright, on Queensland's Sunshine Coast, just north of Brisbane. It may be significant that Yamba lies at the mouth of the mighty Clarence River, while Point Cartwright is at the mouth of the Mooloolaba River. A quick check shows that the Yamba photos were the work of a commercial photographer, Bill Counsell, who is more used to recording outdoor weddings. His dramatic pictures of the foam have circled the world, copied on hundreds of websites and blogs, usually without a credit line. Counsell sold his photos to the Sydney Daily Telegraph and the London Daily Mail, and then they took off in a media frenzy, being copied globally in the press, on TV and the internet, usually without permission. A website in Ukraine displayed the photos with captions in Cyrillic script. "I've had an amazing response from all corners of the world, from men's girly magazines to German science magazines and everything in between," Counsell told OhmyNews International. What caused the foam to form? Counsell, who lives within walking distance of the clubhouse, said he learned of the foam starting to build the day before he took his sensational photos. "I think the foam was created by a combination of events: no rain at all for two or three months and then a lot of rain over a couple of days at the same time as the sea was in a semi-cyclonic condition -- large swell, strong winds, heavy rain and big tides," he said. "In lay terms I think the sea was the Mixmaster, the beach was the bowl and the stormwater run-off (full of modern day chemicals and detergents etc) were the ingredients, so with the combination of these factors coming together, the surf was literally whipped up." Commenting on the story in the US, One Man's Blog said: "This is definitely one of the strangest natural phenomenon I've ever read about. Just imagine dumping enough dish-washing liquid into the ocean to turn all the waves into light and fluffy soap bubbles that are soft enough to blow out of your hand into the air!" "Well, that's basically what happened off the coast of Yamba in New South Wales!" "Here we see kids frolicking and playing in the wonderful ocean foam, oblivious to the fact that it is comprised of dead plants, decomposed fish, and seaweed excretions!" As a wave starts to form on the surface, the motion of the water causes the bubbles to swirl upwards and, massed together, they become foam. The foam 'surfs' towards shore until the wave 'crashes', tossing the foam into the air. John Dengate of the NSW Department for the Environment and Conservation was on ABC Radio yesterday and said it was due to small sea organisms that are literally pulverised by the large swell resulting in a very fine protein suspension in the sea. The protein mix coats the air-bubbles created by the waves to create a stiff froth, just the same way as egg protein coats air bubbles to make meringue, and beer protein coats air bubbles to produce a head of foam in a beer glass. Finally, Ian Scott-Parker, from a town called Hurricane in Utah, USA, wrote: "The explanations for the creation of the foam seem too varied to be reliable. Various natural products are foaming agents (extract of horse chestnuts was used in early fire extinguishers) but saline solutions are usually considered to be anti-foaming agents. "On balance I like the crushed plankton providing protein foaming agent hypothesis, when the high level of fresh water coming in from the Clarence River provides a suitable non-saline environment for the foam to be generated. He added: "There is already a range of cosmetic products named Aussie on sale in the USA, so I feel sure there is room in the woo-woo sector for All Natural Yamba Plankton Body Wash -- Harness the Power of Cyclonic Weather Systems To Beautify Your Skin. A version for men would be a possibility -- Enriched With Guinness Head for a Whiff of the Pub and the Ocean All in One Lotion." Photos copied by kind permission of Bill Counsell.